Neighbourhood Legal Services (London & Middlesex) Inc. is a community based not-for-profit agency whose diverse team of caring professionals and volunteers provides legal services to low income individuals and communities to promote access to justice and to improve quality of life. We do this through summary advice and referral, representation, community development, law reform and public legal education. As a non-profit corporation, NLSLM is governed by a Board of Directors. On October 16, 2017 we had a Annual General Meeting marking the thirty-first anniversary of NLSLM. 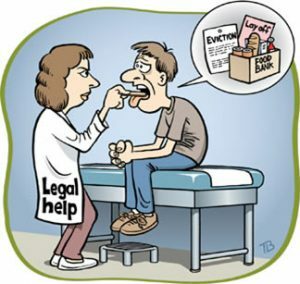 Many people do not think of their everyday problems as being “legal problems” and do not know that they can get help until it’s too late. Take the Legal Health Check-up today to determine what, if any, legal problems you have and how we can help. We can provide summary advice, referrals, or legal representation.